New Hot Tub for 2019 ! With direct access to the Atlantic Ocean right down the street and an assortment of amenities within walking distance, Poppa’s Place is the perfect spot for your next Outer Banks vacation. This charming 3-bedroom cottage in Kill Devil Hills is just steps away from the popular Avalon Fishing Pier, where you can cast a line for the catch of the day or simply sight-see and catch a spectacular sunrise over the ocean. Awful Arthur’s Oyster Bar—a favorite dining establishment among locals and vacationers alike—is conveniently located at the end of the block. When you vacation at Poppa’s Place, you’ll be greeted by bright and cheerful decor in every room of this updated cottage that has been meticulously cared for by its owners. You’ll find flat-screen TVs in each of the bedrooms, as well as the living room, which features ample and comfortable seating for the entire family. 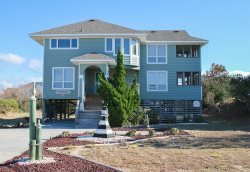 A spacious kitchen and breakfast bar are located just off the living room, and a dining area with a table for six offers plenty of space for enjoying a home cooked meal or takeout from your favorite Outer Banks restaurants. If you want to soak up the sunshine, step outside onto the large back deck where you can relax with a beach read and take in the scenery. Searching for a spot to revel in the cool ocean breezes while staying out of the sun after a day at the beach? Poppa’s Place boasts a huge screened-in porch across the entire front of this Outer Banks vacation home. Grab a cup of coffee or a glass of wine and kick back in one of the cushioned Adirondack chairs for an afternoon or evening of ultimate ocean side relaxation. In addition to its convenient location just a block from the beach, Poppa’s Place is also just a quick trip from a variety of other Outer Banks attractions and amenities. Front Porch Cafe—a local coffee shop that offers an array of beverages and bakery items—is a quarter mile away, and Chilli Peppers Coastal Grill, Two Roads Tavern and the famous Brew Thru are all within a half mile from your home away from home. History buffs will enjoy easy access to the Wright Brothers National Memorial, which is just 2.5 miles to the south, and features a museum and walking trails, as well as a monument commemorating the Wilbur and Orville Wright's first powered flight on Dec. 17, 1903. From its close proximity to dozens of local attractions and popular restaurants to its direct access to the shoreline of the Atlantic Ocean just down the road, Poppa’s Place provides everything you need to make the most of your family’s next Outer Banks vacation. Book your stay today! Need more room for your group? Consider also renting RoxSand. These two homes are only a couple of houses apart. Follow Poppa's Place on Facebook here!